Due to some review code hold-ups, those of you interested in picking up Dying Light may have noticed an utter lack of reviews across the internet today. While our own coverage won’t be available until later this week, we thought it would be a good idea to get out a “first impressions” piece for those of you still on the fence and starving for a little insight. The super short version: I’ve been pleasantly surprised so far. As is often the case these days, Dying Light review copies didn’t go out until super late; as in just yesterday morning, a mere 24 hours before the game’s release. We’ve had no word from Warner Bros. Interactive as to what the holdup was but, again, these things happen from time to time, so we’re just going to roll with it. The obvious assumption most make when review copies are doled out so late is “The game must be terrible and the developer/publisher doesn’t want any press until absolutely unavoidable.” Only about five hours into Dying Light, I think I can safely say that this is not the case. Keep in mind that my play time has been focused exclusively on the single player campaign and I haven’t even had a chance to try out co-op or the now-free “Be the Zombie” mode but, based on what I’ve experienced, Dying Light is performing as well as you would hope. The gist of the story is that a viral outbreak has turned an entire city into a writhing mass of flesh-eating zombies. There are only a handful of survivors left, which have been broken into two factions. The normal folks live in a fortified building called The Tower (Dying Light is a prequel to Destiny, now canon.) while the “we take what we want and kill who we please” raider group lives just around the corner. You’ve been dropped in as an operative aiming to covertly track down a warlord and some secret documents that may hold the secret to a cure and, of course, your whole mission goes sideways from the moment you hit the ground. Shacking up with the less insane faction, you’ve been given the role of a Runner, people who venture out into the dangerous city in order to complete odd jobs, set up traps, gather supplies, etc. The first thing that you’ll notice about Dying Light is that the game is super easy on the eyes and, once you get used to the somewhat unique control scheme, it controls quite nicely. It takes a good hour before you get to the *ahem* meat of the game but, once you’ve been let loose on the city, Dying Light becomes a lot of fun. It’s cheap as hell to simply compare a game to other games, but that’s probably the easiest way to get my thoughts across this early on. 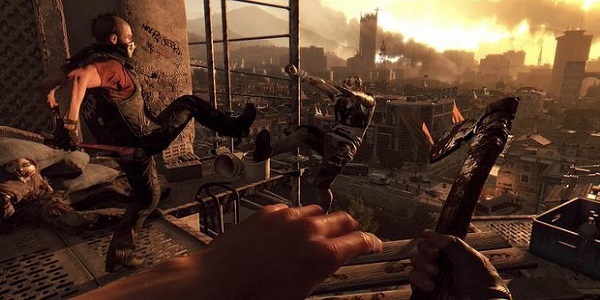 If you were to take the parkour of Mirror’s Edge, bolt on the crafting and post-apocalyptic setting of a game like The Last of Us, and pile all of that into a world that operates much like the Far Cry series, you’ll have a good idea of what to expect from Dying Light. And yes, I mean all of that in the best way possible. There are lots of zombies to worry about in Dying Light and your best option is almost always to turn tail and run the hell away. The world is built with tremendous care, with loads of pathways, nooks and lots of verticality to take into account. Thankfully, the controls match this setting well. Before you know it, you’ll be sprinting through the city, leaping from rooftop to rooftop, climbing up telephone poles and grapping barely-in-reach ledges like a pro. Getting a good run going feels exhilarating, especially when you manage to make it from Point A to Point B without a zombie ever catching a glimpse of your fast-moving hide. When the going gets tough, though, you do have a few tricks up your sleeve. You’ll have a few ways to distract zombies with items like firecrackers and, if you have to turn to blows, you’ll have all manner of melee objects to beat the pulp out of them with. You’ll also want to constantly scavenge on the go, picking up new weapons and objects that you can use to craft helpful items along the way. Again, this is only my account from about five hours into the campaign but, so far, I’m having a lot of fun. I have a suspicion that the game’s mission structure is going to start to feel repetitive soon, but the free-running has been exciting enough to keep me moving full steam ahead up to this point. Along with the story missions, you’ll occasionally find citizens in need of help or on-the-fly objectives like picking up loot from supply drops before the bandits get there. Most of these revolve around “run to this place and push this button/grab this item” structure, but that could always change as I move further into the game. To keep you occupied on the side, you’ve also got lots of blueprints to track down in order to make new weapons, three skill trees to unlock and earn new abilities and stat boosts from, under siege safe houses to liberate and serve as relief shelters (you DO NOT want to still be on the streets at night) and several other systems I’ve barely had an opportunity to dig into. So, there you have it. Our full review will be up later this week but, for the time being, hopefully that will help you decide if Dying Light is up your alley. I haven’t hit any major bugs or anything at this point and, as stated above, I’ve enjoyed myself quite a bit here in the early goings. If you have any specific questions, I’ll do my best to answer them in the comments below. Otherwise, happy running!